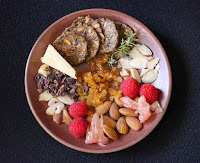 Today was Day #5 of Chocolate, Honey and Almonds Theme Week. The Hey Honey! 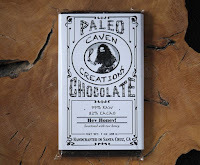 82% cacao dark chocolate bar was from Caven Creations (Santa Cruz, CA). This dairy and gluten free bar was made with 4 ingredients: raw, organic, Fair Trade Ecuadorian Rio Arriba cacao, raw organic honey, raw organic Tahitian vanilla beans, and Himalayan pink crystal salt. 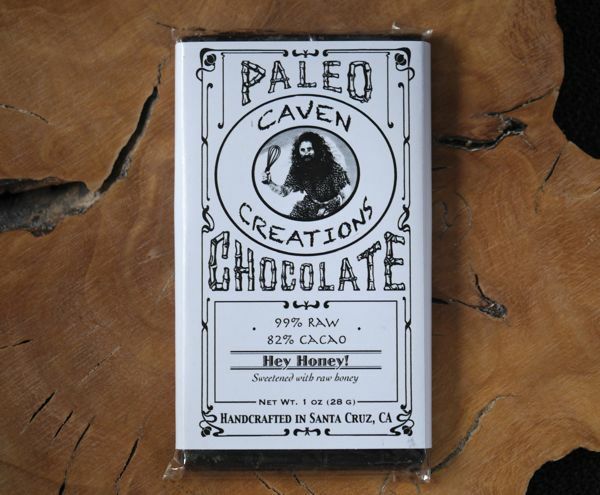 The raw cacao bar had a faint dark chocolate aroma, and a relatively even dark chocolate flavor, with a few bites having a bit of an earthy flavor note. The sweet level was low in this ultra-dark bar; some bites had a bit more of a natural honey lilt. And tiny salt crystals provided some occasional texture. This bar's wrapper was adorned with a picture of a caveman (with raised club). Accordingly, I enjoyed this bar with a paleolithic era-inspired plate that included: seed crackers, cacao nibs, berries, and of course honey and almonds.